Wherever you go on the web there are forms! From registering for a new service, to sending a Tweet or updating your Facebook status, the role of HTML Forms is to start an interaction with your visitor. Different forms interact in different ways – some may just store data relevant to your current visit, some send emails, some interact with databases. In this tutorial, I am going to introduce you to some standard form field types. Since HTML5 kicked in, the number of field types has expanded – but they are more descriptive which makes them easier to learn! 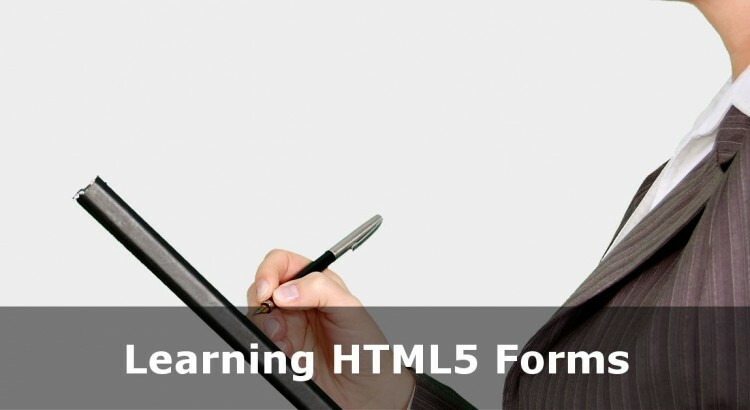 So let’s get into learning HTML5 Forms! In this exercise we will build a basic contact form. For the purposes of this tutorial, we will make a non-functional form, but the next one we will hook it up to a program that sends emails. The thing to bear in mind is that the action must point at a relevant, active URL to be able to function correctly. There are two ways to send form data over the Internet: POST and GET. The Post Method sends all the form fields in a kind of ‘hidden’ way. The GET Method sends the data as part of the URL. It is less secure since visitor tracking, history storage etc have your personal data in the URL. It becomes much harder to control when using large forms. So in most cases, you’re best to use method="POST". There are a lot of different data types in HTML5, but I will introduce you to the most common and then over the course of these tutorials, introduce you to additional types. All your Form Fields must be placed between your opening and closing form tags. Note: there is no </input> tag. type: as quite a few form fields can use the <input> tag, the type specifies what kind of form field it is. In this case it’s just “text”. name: all your fields should have a unique name. Try to avoid spaces in names – underscores make a good alternative. value: if you want to specify a ‘default value’ then you can do it here. The actual value of the text box is whatever the user puts in before they submit the form. placeholder: not supported by really old browsers. This is a description which only appears when the text box is empty (or where value=""). This is an alternative to writing words next to your text box to inform the user of what you want to go in the box. maxlength: what is the maximum number of characters allowed in the text box? This is important to stop spammers from posting reams and reams of data into your form in order to slow your site or your hosting server down. cols and rows: this determines the size of your textbox. cols is not the same as size so you’ll have to experiment with cols to get the width to be the same as any ordinary text boxes in your form. Rows however is how many lines of text will be visible at any time. The user can put more in if they want to, but then a scrollbar will appear. Text Between the Tags: textareas don’t support the value="" attribute. Instead whatever appears between your opening and closing <textarea> tags will be the default value, including any new line characters you insert. If you want to provide a text box for a password, then follow the model for type="text" but replace with type="password". Note however that any default value will be obscured. You can still use placeholder in the same way. A word of caution: Although visibly-speaking, the password field is non-readable, the way it is transmitted is in readable form. For this reason websites should use SSL to encrypt form data as it’s sent across the web. And before storing in any database, passwords should be ‘mashed up’ in a way that means the actual password inputted is still non-readable. type: there is a wide choice of types: datetime-local, month, week and time. These give different options for input depending on what you want from your visitors. If you want to give your users a list of options to select one from, then you need the <select> tag. So your total list of options is contained within <select> </select> tags. Then each individual option is contained within <option> </option> tags. The value="Gold" is the actual value transmitted for the option selected. The text between the option tags is the readable text your user will see. required attribute: we have used HTML5’s required attribute on the <select> tag. This is fine for browsers that support HTML5. setting a default answer: if you use the selected attribute on one of your options, then that one will be selected by default. If you don’t set one, the first option in your list will be selected instead. Made the Top Option Value Empty: by making the top option have an empty value, it will not pass the required test, which forces the user to select another option. When building a form you always have to be thinking about how people might use your form. They don’t always react the way you hope! Finally let’s look at a couple of buttons you can add at the bottom of your form. The only thing which needs explanation here is that the value attribute sets the text to be displayed on the button itself. In HTML5, the button text sits between the opening and closing button tags. The same difference in how the text is displayed applies to a submit button as it did on the reset button. Well done on making it this far. There are other form fields than those listed here, but as this is a beginner’s tutorial, I wanted to limit it. Feel free to use the comments if you have any questions!